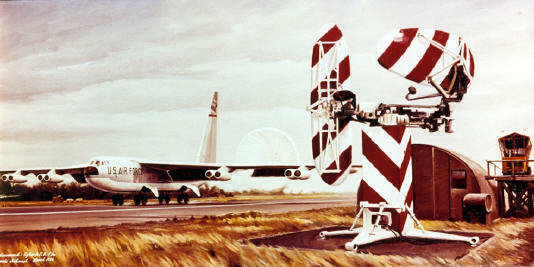 As part of SAC's plans to disburse its B-52 bombers, the 4135th Strategic Wing was established at Eglin Dec 1, 1958. It's 301st Bomb Squadron flew B-52G. On February 1, 1963 it became the 39th Bombardment Wing. both units maintained airborne alert, ground alert, and participated in numerous exercises. the 39th was inactivated on 25 Jun 1965 when its 301st Bomb Squadron was transferred to Barksdale AFB in Bossier City, Louisiana. Eglin has played a prominent role in airpower history. In 1931, personnel of the Army Air Corps Tactical School (Maxwell Field, Alabama) looking for a site for a bombing and gunnery range, saw the potential of the sparsely populated forested areas surrounding Valparaiso, Florida, and the vast expanse of the adjacent Gulf of Mexico. A local businessman and airplane buff, James E. Plew, saw the potential of a military payroll to boost the depression-stricken economy in the local area. He leased to the City of Valparaiso 137 acres on which an airport was established in 1933, and in 1934, Plew offered the U.S. government a donation of 1,460 contiguous acres for the bombing and gunnery base. This leasehold became the headquarters for the Valparaiso Bombing and Gunnery Base activated on 14 June 1935 under the command of Captain Arnold H. Rich. On 4 August 1937, the base was redesignated Eglin Field in honor of Lieutenant Colonel Frederick I. Eglin, U.S. Air Corps, killed on 1 January 1937 in an aircraft crash. Durling the early 1960's, as the Southeast Asia conflict increased, Eglin was home of the Air Force Special Forces insurgency units - the Air Force Green Berets. There was also emphasis on conventional weapons and the responsibilities at Eglin grew. On 1 August 1968, the Air Proving Ground Center was redesignated the Armament Development and Test Center to centralize responsibility for research, development, test and evaluation, and initial acquisition of nonnuclear munitions for the Air Force. On 1 October 1979, the Center was given division status. The Armament Division, redesignated Munitions Systems Division on 15 March 1989, placed into production the precision-guided munitions for the laser, television, and infrared guided bombs; two anti-armor weapon systems; and an improved hard target weapon used in Operation DESERT STORM during the Persian Gulf War. The Division was also responsible for developing the Advanced Medium Range Air-to-Air Missile (AMRAAM), an Air Force-led joint project with the U.S. Navy. As part of the Air Forces' strategic plan to guide the service into the 21st Century, on 1 October 1998, the Air Force Development Test Center became the Air Force Materiel Command's center for air armament. As one of AFMC's product centers, AFDTC was renamed the Air Armament Center (AAC). The Center is responsible for development, acquisition, testing, deployment, and sustainment of all air-delivered weapons. The AAC applies advanced technology, engineering, and programming efficiencies across the entire product life cycle to provide superior combat capability. The Center plans, directs, and conducts test and evaluation of U.S. and allied air armament, navigation/guidance systems, and command and control (C 2) systems. It operates two Air Force installations, providing host support to Eglin and Kirtland AFBs, and supports the largest single base mobility commitment in the Air Force. AAC accomplishes its mission through four components: The Armament Product Directorate (Eglin), 46th Test Wing (Eglin), 96th Air Base Wing (Eglin), and 377th Air Base Wing (Kirtland). In 1999, precision-guided munitions proved their effectiveness in Operation ALLIED FORCE. During the 78-day air operation, precision munitions destroyed numerous targets with unparalleled accuracy, resulting in minimum collateral damage, and no U.S. casualties of war.